As most of you are well aware, I have been working on getting my very first iPhone app for the past several months. I don't want to go over every single step that I went through or re-hash some of the bumps in the road, you see a compiled list of all the posts I have done on my iPhone app in the past here. However, I want to cover some of the lessons learned, and of course where you can get the app right now. In a nutshell, the Ad Alert iPhone App allows you to check your Google Adsense earnings hands free! It has a very unique feature that no other Google Adsense apps have. Of course, its like other apps where you can quickly and easily check how much you have earned in Google Adsense for different periods of time. But the unique feature, is really why most people will be interested in it. Instead of going nuts logging into your Google Adsense account every hour to see if you have made any money, wouldn't it be nice if your iPhone just told you? Well, that's exactly what the Ad Alert app does! You specify at what amount you want to be notified, and your phone will make a cash register or other sound (that you pick) every time you earn that amount! So, if you want to get notified every time you earn $10, you'll hear a “cha-ching” sound (like a cash register) when your total daily earnings hits $10, $20, $30, etc. You can input any amount you want. Buy the AdAlert App Right Here! I learned a great deal developing this app. I will do a more comprehensive post in the future. But I was primarily reminded of the importance of hiring the right people. I was able to outsource this project to a team of developers that I hired from Elance.com. Luckily, I have worked with a number of developers in the past, so I knew what to look for going into the project. I would say one of the key takeaways is to always communicate as much as possible with potential programmers BEFORE you hire them. When they submit a bid, ask follow up questions, and overall try to make sure that they understand all the intricacies of the project. In addition, this will also help you weed out the developers that are not very responsive or may have a difficult time communicating with. In fact, by doing this I actually prevented a disaster I believe. This was not my first iPhone app idea. My first idea was for a drawing game. However, because I was able to communicate with several developers before actually hiring anyone, I was able to uncover several potential problems and expenses before I ever committed to anything. By uncovering these issues, I decide to not pursue that project. In addition, its critical to do as much background checking as you can. Look at past reviews and projects as much as possible. Overall, the development went fairly smooth, but that of course is only part of it. Now that the app is available as of today, I begin the next phase of marketing and managing the app. I will continue to share the lessons I learn over the coming weeks and months with this new iPhone app. I know that many of you are Google Adsense users, and would absolutely love it if you were to check out my app. So, for those that leave an honest review of the app on the Apple store, I will send you an original guide I've written on planning and executing a large authority site. I've done this once with my NichePursuits.com blog. This is a different strategy completely from building small niche sites (which I have covered extensively here). 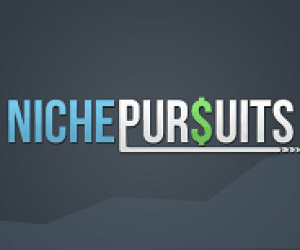 However, as I've recently discussed, and discussed on the Niche Pursuits Facebook page, I am planning to put a lot of time and energy into a new blog in a completely different niche. This will be different then a typical niche site. I won't be focused on 1 keyword, but rather focused on building a brand and destination that people will want to come back to again and again, like I have with Niche Pursuits. This is a big project and may take 6 months to a year before I see a lot of traction, but I'm committing myself. So, at the outset, I've written a 15-page guide that walks through how YOU can build a large destination type site. I go into the importance of branding and standing out from the crowd. I also give tips on the importance of keyword research in the entire process, as this is still very important to get traffic from ALL sources. So, if you want to see how I am going to build a branded site and potentially how you can do the same, I think you will love the guide. and then email me a copy of your review that is visible in the App store. Then I'll send you the guide. Overall, its been quite an adventure creating my first iPhone app, and its quite exhilarating to finally see something I create LIVE on the App store! Over the coming days, I will be sharing how the app does, and other tips I learn throughout the process. If you have any questions or comments, I would love to answer them below. Congrats Spencer! I just submitted my first for approval today. I think with your following and the trust you’ve built, you should see some ROI fairly quickly. Thanks Jason, best of luck with your app as well. I will definitely check it out as soon as I get my iPhone. I am also interested in building apps in the future, but the thing that amazes me is the time it takes to develop one. What seems to be the most time consuming factor in the process? The time the developer actually makes the app or the time it takes to express what you need and how it should work? Did it take longer than you expected? What was the most surprising aspect of it? Kris – honestly this could have been developed much quicker. The reason it took so long for me is that I had several other projects that I was working on at the same time. If I was only focused on this one, it would have taken about 2 months probably. But, I initially started with a different idea, scrapped it, came up with a new idea, and was slow to develop it. So, the time was mostly my fault just planning where to take the app. The developers were great. So, if you have a plan on paper, and once you hire someone, it can be done pretty quick (depending on the idea). i think the most important thing you should consider that is how to convince people that your app is safe to use due to the adsense account and data is quite sensitive stuff. Ted, the app is quite secure. It utilizes the Google Adsense API so the data comes directly from Google. So, when a person is logging in, they are doing so directly through the API. Congratulations on your launch. You’ve done a great job diversifying your income. I’ll be sure to buy it today. It will save me a lot of time since I won’t need to check my Adsense account anymore…I’ll just wait for the beeps. Congratulations on the launch of your adsense app. You’ve done a excellent job by building the app and sharing everything here. Love the idea about “cha-ching” sound. Congrats on completing this huge step toward diversifying your income! Alas, there are no iPhones in my house (we’re all Android fans), so I have no way to review your app in return for a download of your authority site report. This bums me out greatly, as I’d really like to read what you have to say on the matter. Please say you’ll be offering this report via another method some time soon? I don’t know if the report will be available otherwise just yet. The report was created specifically as a bonus for the early iPhone app adopters. But thanks for the feedback, and I will consider making the information available in another way. I pulled the trigger and bought it. Very nice. I made a video of it running on my iPad…it works great on there. Mike – thanks for the AWESOME video review of the app on your iPad! Obviously it was tested and developed for the iPhone, but you show that it works great on the iPad too…thanks for the review! Nice one Spencer. I just got it. However, my account is in a different currency but the app shows USD by default. Chris – I’ll have my developers look at the issue right away. Thanks! Nice one, but I think you’ll struggle to sell the app. It’s a pretty thin application, and doesn’t really offer anything other than a sound, which I expect will become annoying after a very short while. Why also didn’t you have some lights on when you recorded that video? Looks awful, I’m afraid to say, with you glowing red – surely it would be better to wait until morning, and open the curtains! This is the first the I have commented on your blog, after quietly reading post after post for some months. I am impressed that you have diversified further and are venturing into iPhone apps. It seems there is a lot of money to be made in this area if you are willing to commit to learning how this business works (along with a lot of luck). I hope this new niche works well for you and I shall follow what happens to your new app venture with interest. Hey Catherine – thanks for the first comment! I am excited to get this first app complete, and hope it goes well (so far so good) – but I also hope to create additional apps down the road now that I have “learned the ropes” a bit. Just want to congratulation on your new iphone app, must be very exciting to see your own app launch on the app store. Thanks Brian, it is indeed pretty sweet to see in the App store! Purchased the app. I was expecting better reporting. Just a friendly note that if the reporting was there then I would only need this app. Look at the my revenue app that reporting is great. Love the push notification. It works very nicely. I am considering a change to my review as well. I prefer to have just one app per function so that I am not flipping back and forth but that is just my personal preference. It does what it says it was just my assumption that it had other features with more in depth content. Thanks again. Consider adding reporting details as it would be the best out there for Adsense info. Nice Spencer! Really pleased this project has come together. Nice to finally see it live in the app store isn’t it? Hey Andreas – as you know it IS nice to see your own app live on the app store! Thanks for all the great advice you gave me as well. Will be publishing our podcast interview soon (probably later this week). I bought your app today and it looks really cool but it doesn’t work for me. I tried logining in and the authentification initiated but no earnings showed up. I definately got clicks and made money because it shows up in my adsense account. So I logged out and logged in again but this time I purposely used a incorrect password and it still authenticated me as successfully logged in ( no earnings showed). Am I doing something wrong here, Any suggestions? Hey Nigel – Thanks for the purchase. The app should work right away, but I am wondering if the iPhone is not connecting to the internet? (I assume you have coverage though). However, it also could be an issue with the AUD currency. I am going to have my developers look at and fix as needed any issues arising from different currencies. And of course, any updates will be available for free. I’ll get it working for you! Yeah no worries Spencer. I ‘m confident you’ll nut out the problem. I hope this improves the app to make it even better bro. Does your app show earnings per site? I would pay money for this feature. Peter – it just shows earnings as a whole for the account. The draw of the app is the ability to quickly check and the sound notifications so you don’t have to manually check. Just buy your app and provide a review in the appstore. Thanks! I’ll send the bonus guide by the end of the day! Polly, that is the Ad Alert server. Congrats! Very excited for you! I definitely think that hiring the right people is crucial for the success of an app project. There are lots of people on Elance who will bid on your project but who are unresponsive to questions, you can’t communicate well with, or they don’t really know what they are talking about. I agree that you should definitely make sure that you ask each developer a few questions regarding the app that will act to test their knowledge and communication skills. My rule of thumb is that if I don’t get a response in 1 business day that they obviously don’t want to work with me that bad and probably wouldn’t do a good job of communicating if I hired them. Yes, that is a strict requirement, but a necessary one if my opinion. Anyway, congrats once again on your app release! I just bought it and left a review (just going to hold onto it until I register another AdSense account under an LLC) because I am really excited about your authority site guide! Sounds really cool! Am also loving the free giveaway as a marketing strategy! Hopefully a lot of your readers here will buy your app and boost it up to the top apps and get you a lot more sales! Thomas – thanks for the purchase and review! I agree that pre-hiring questions are critical to hiring a good developer…hope your apps go well! Congrats Spencer on your new iPhine App! best of luck on this one and any future apps? How about an Android version? Android is a possibility. I’m brainstorming other app ideas as well. Like the app and the USP. Roughly how many hours development did this app take to get to deployment. What did you learn and would.ypu do it again in a hurry (or is it too early to tell). Unfortunately im Andriod all the way. But I would install something like this on Andriod, as its got that fun factor element that I like. Ps excellent interview with Pat the other day. Learned alot through the app development, I’ll have to write a full post on that. There may be an android version on the way depending on how the iPhone version does…so far so good by the way! congratulations Spencer. mine is stuck in the review stages. many are still profiting from adsense – no doubt the app will be a success. looking forward to more updates. Nice strategy giving away a report for a review, it may be applied to other apps to. I’m wondering is this is ok with Apple TOS, did you check anywhere for this? Sent you an email for the bonus guide and looking forward to getting yours on my Android phone later. Congrats on getting your app out there. Can you just clear up the security aspect please. In one comment you say that it is using the Adsense API so there is no security issue and in another you say that your server’s IP is being used. My main issue in the past with using such apps is in case my account were to get banned due to the IP address which is logging in. Sounds like this wouldn’t be a problem with your app, but just want to check. In addition, can you explain how you were able to get this developed without giving the developer access to your AdSense account? Was this also due to the API? In order to send the push notifications, the app must use the AdAlert server. So, while your login credentials are secure, the server is used to check your Adsense earnings – so the server IP is being used. Hope that is clear now. Also, I did indeed allow my developers access to my Adsense account (with a temporary password) in order to develop and test the app. Congrats on the completed app Spencer. I don’t actually have a Smartphone yet, but it’s in the pipeline. However, what I’m more interested in is the guide to building an authority site. I’d like to add my voice to suggesting you make it available via another route. I’m happy to pay for it. Lee – its only available for early app purchasers right now. I will have to consider what to do in the future with it. Hi, SH, Conratulations with your App. Do you know what does not exist on this website? the search box. Hopefully you can add to to this website. I don’t need your app, but I’m really interested in your authority site guide. I’m not asking for a freebie; I just wanted to say that it’s a great idea you’re offering the guide as a bonus for people who buy your app and leave an honest review. I normally don’t buy apps as an iPhone user, but because I want your guide I might actually pay the $2.99 price. I know it took you some time to write/ come up with the content for that guide; I consider the price to be more than fair for the solid information I know will be in there. Great stuff as always Spencer! This app is no longer available in iTunes. I bought the app when I had an iPhone4, and now I’ve just upgraded to 5. I see that it’s not available in the store. I can probably get it off of the old phone. Is there any reason I shouldn’t? Any problems that I am unaware of? Thanks Spencer! Good Article BTW.